National security will not be in jeopardy when developing the country, Ports and Shipping Minister Arjuna Ranatunga said. He was speaking at a meeting at the District Secretariat Auditorium in Trincomalee on Thursday. The minister said the government will give priority for the country's legal procedure and proceedings when considering any agreement with foreign investors. "It does not matter if they come from Singapore, China, Japan or Ethiopia," the minister said. The meeting was held to discuss issues pertaining to lands owned by the Sri Lanka Ports Authority in Trincomalee district. It was discussed to extend legal rights of these lands to the people who have settled and have been living there for several years. Opposition Leader R. Sampanthan also attended the meeting. "The country's development projects should depend on the government's policy instead of personal interest. Foreign investment plays a significant role in the developing process of a country. We have to demand them to obtain the targeted economic growth," Sampanthan said. "Singapore mainly depended on foreign investment when carrying out their development projects in 1980 but we never obtained them for the country at the same period. Hence, Singapore achieved their development targets while we lost. The time has come to learn lessons from Singapore and welcome appropriate foreign investments to the country at the same time, confirming and safeguarding national security. We should think beyond traditional ways and means," the Opposition Leader said. 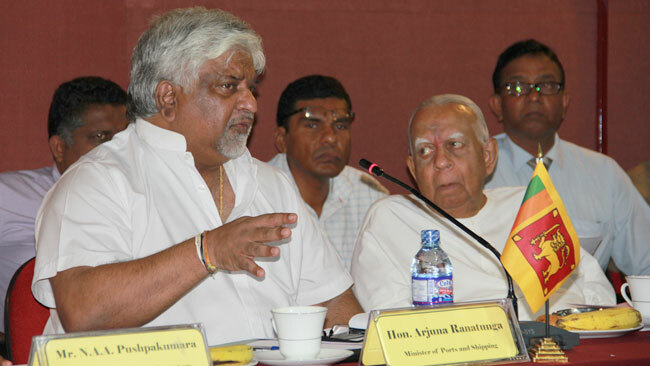 Ranatunga said that the expectation of everyone was to develop this country as one nation. "The Unity Government is implementing its development plans. It is up to the people to support the government's effort. The President or the Prime Minister would never engage in any activity which will have a bad impact on national security. The Opposition Leader is also of the same view," he said. The attraction of the investors to the country would depend on government policies and the law applies to them. Politicians in the previous regime was concered of their own benefits and personal interests when they considered investors to the country, Ranatunga said. "The Hambantota Harbour is a good example. I would never allow any investor to enter the country avoiding legal procedures. The rule would be the same with regard to the procedures of the Ports and Shipping Ministry. We saw a completely different practice followed by the previous regime on investors. Hence, today many in the previous regime have been summoned before the law," the minister said.